← Sunday morning style: the stars go out in the sun! Every year there is a surprise at the Oscars, fashion wise. After all, all the red carpet ritual is meant exactly for that purpose and dozens of stylists and other professionals busy themselves for months trying to make the evening nothing short of spectacular for us, common people. This year was a very good year, I must say. Where some comments are now criticizing “safe choices”, I thought the Oscars 2012 were the fashion party of personality, elegance and glamour. So there we were, twitter at hand, screen in view, watching all the grooming and styling, sharing opinions along the way, when suddenly all this tweeting became about THE bracelet – WOW! What? Who? We want details!!! As a jewelry designer, Anna Hu brings together her passion for classical music, her cultural heritage in the form of Chinese aesthetics and the expertise of French craftsmanship, to create jewels that are not only grand but beautiful, delicate, perfectly colored, begging to be loved and worn. It may take years before a particular idea is becomes a finished piece of jewelry, it takes time to perfect the drawing and to find the ideal stones. Not even watercolors are good enough to express the vision of this perfectionist: she “paints” with actual gemstones on clear wax. And all this happens while listening to classical music. What a dream! Born in Taiwan, Anna is now based in NYC. Actually, her first career choice was to be a cello player but destiny wanted otherwise and Anna went through two Art related academic degrees before discovering jewelry design and flying through a GIA diploma. Before launching her own line and opening her first store in 2008 (at the Plaza in NYC), Anna worked at Christie’s NY, Van Cleef & Arpels and Harry Winston. Basically, the jewelry professional equivalent of Ivy League! A few years ago, Madonna fell in love with a beautiful diamond cross that Anna was wearing and borrowed it for the Met Costume Institute Gala in 2009, along with a beautiful pair of colored stone earrings. From then on, celebrities have regularly chosen Anna’s designs to dress up their red carpet looks – Drew Barrymore, Scarlett Johansson and Hillary Swank, to name a few. Madonna has not forgotten this exquisite designer, inviting her to create a few pieces to be featured in her movie W.E., the story of two great jewelry collectors that I can´t wait to see! The particular bracelet that Gwyneth Paltrow chose to wear is a one of a kind jewel. 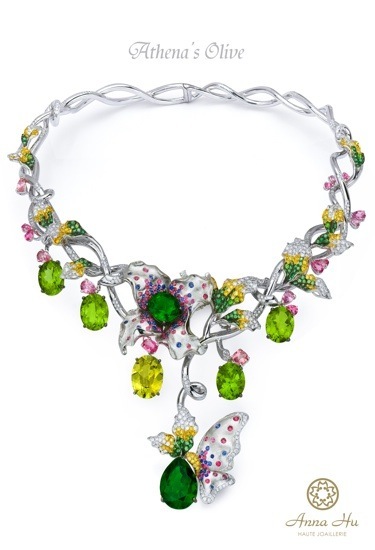 According to Style.com, it has a total of 163 carats of rose-cut diamonds and is priced at a hefty 1,000,000$. Gwyneth Paltrow’s overall look was an absolute hit, the jewelry being the cherry on the cake. Anna Hu ’s bracelet caught millions of eyes and brought the young designer’s name to the limelight. This entry was posted in Bracelets, Diamonds, Jewelry, People and tagged Academy Award, Anna Hu, Bracelet, Costume Institute, Diamond, Gwyneth Paltrow, Harry Winston, Madonna, Oscar, Scarlett Johansson, W.E.. Bookmark the permalink.